ABC Science, April 19, 2012. A protein produced by bone cells could help in the development of better treatments for osteoporosis. Professor Hiroshi Takayanagi, of Tokyo Medical and Dental University, and colleagues, report their findings today in the journal Nature. “I hope our discovery will lead to better treatment developments for osteoporosis, arthritis, or bone fractures,” says Takayanagi. The strength of our bones is controlled by hormones and by the balance between bone formation and breakdown (resorption). If too much bone is broken down and not enough is made, bone density falls and the chance of fractures increases. Takayanagi and colleagues have found that bone forming cells, or osteoblasts, produce a protein called semaphorin 3A (Sema3A), which has previously been known to regulate nerve and immune cells. They found not only does Sema3A decrease bone breakdown but, unlike current osteoporosis medications that do the same, it also boosts bone formation at the same time. When they began their study, Takayanagi and colleagues already knew another protein produced by osteoblasts, called osteoprotegerin, decreases bone breakdown. But, the team suspected there would be other proteins that did the same. The team checked the activity of proteins produced by osteoblasts from mice genetically engineered to have no osteoprotegerin, and found they were still inhibiting bone breakdown. They isolated the molecule responsible for this inhibition and using mass spectrometry identified it as Sema3A. The researchers then tested mice genetically engineered to have no functional Sema3A and found an increase in bone breakdown and a decrease in bone density. Surprisingly, however, they also found that bone formation was also lower in these Sema3A knockout mice. In their final experiment they injected Sema3A into diseased mice and found it prevented further bone loss in osteoporosis and accelerated bone regeneration in the case of fractures. “Many molecules regulate either resorption or formation but this is the first molecule that regulates both at the same time,” says Takayanagi. Dr Gethin Thomas of the Muscoskeletal Genetics Group at The University of Queensland Diamantina Institute welcomes the research. He says more 2 million Australians are currently affected by osteoporosis and half of women over the age of 50 are expected to suffer at least one osteoporotic fracture. “The gold standard is to find therapies that can build bone as well as stop bone degradation, as osteoporosis is frequently only diagnosed after the bones have already become very weak,” says Thomas. Sema3A is known to play important roles in the development of heart and nervous system, but researchers are yet understand exactly how the protein acts to boost bone formation and inhibit bone resorption. “It’s possible there might be side-effects on the heart or nerve generation but they haven’t explored that at all in this paper,” says bone cell biologist, Associate Professor Natalie Sims from the St Vincent’s Institute. The bony skeleton is maintained by local factors that regulate bone-forming osteoblasts and bone-resorbing osteoclasts, in addition to hormonal activity. Osteoprotegerin protects bone by inhibiting osteoclastic bone resorption, but no factor has yet been identified as a local determinant of bone mass that regulates both osteoclasts and osteoblasts. 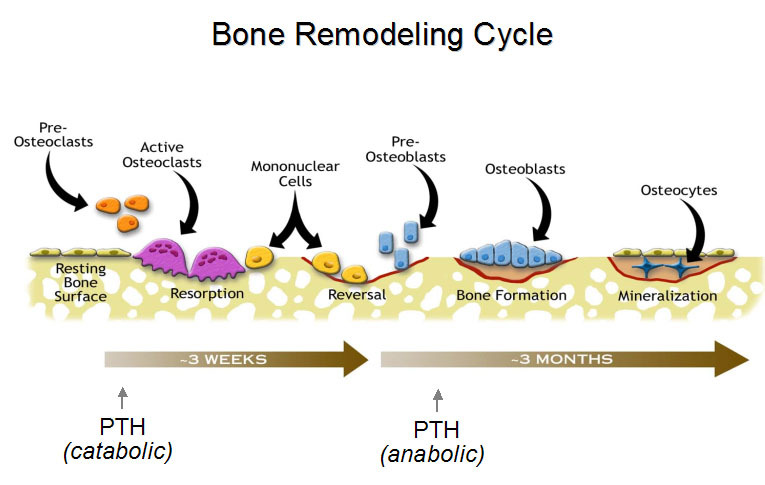 Here we show that semaphorin 3A (Sema3A) exerts an osteoprotective effect by both suppressing osteoclastic bone resorption and increasing osteoblastic bone formation. The binding of Sema3A to neuropilin-1 (Nrp1) inhibited receptor activator of nuclear factor-κB ligand (RANKL)-induced osteoclast differentiation by inhibiting the immunoreceptor tyrosine-based activation motif (ITAM) and RhoA signalling pathways. In addition, Sema3A and Nrp1 binding stimulated osteoblast and inhibited adipocyte differentiation through the canonical Wnt/β-catenin signalling pathway. The osteopenic phenotype in Sema3a−/− mice was recapitulated by mice in which the Sema3A-binding site of Nrp1 had been genetically disrupted. Intravenous Sema3A administration in mice increased bone volume and expedited bone regeneration. Thus, Sema3A is a promising new therapeutic agent in bone and joint diseases. Semaphorins have been known as one family of inhibitory axon guidance molecules. The semaphorins include secreted, transmembrane, and GPI anchored extracellular molecules that are involved in regulating axon guidance by inhibiting axons from growing toward incorrect targets. Semaphorin 3A (Sema3A) may play a particularly interesting role in limiting axon regeneration since it is expressed in meningeal fibroblasts that invade the injured spinal cord and surround the glial scar. In addition, the Sema3A co receptors, Neuropilin 1 and Plexin A1, are expressed on axons that regenerate up to the injured region, but do not cross this Sema3A containing region. Thus, Sema3A and its co receptors may have important roles in regulating axon guidance during neuronal development and after neuronal injury. Mone Zaidi and Jameel Iqbal, bone biology researchers from the Mount Sinai School of Medicine commented on the research stating “The protein Sema3A both restrains bone degradation and stimulates bone building in mice, suggesting a potential therapy for conditions such as osteoporosis”, referring to it as probable “double protection for weakened bones”. Uncoupling of bone turnover (with a decrease in bone formation and an increase in bone resorption) has been observed in postmenopausal osteoporosis and microgravity-induced bone loss. Most of the available drugs are either anti-resorptive (For eg., bisphonsphonates), or anabolic (For eg., Parathyroid hormone) on bone. However, Sema3a might act as an effective therapeutic agent by targeting both bone formation and bone resorption.